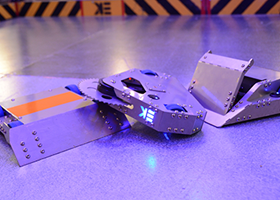 Many years ago there were a number of robot combat TV shows about such as Robot Wars® and BattleBots®, which took the world by storm with these deadly fighting machines. 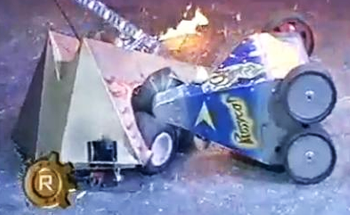 One of our directors (Stuart Barnwell) took control of the famous robot on the TV Show Robot Wars ® called Pussycat, taking the crown as the current All Stars Champion. 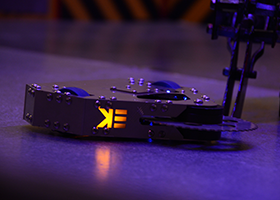 Kinematic Events was formed to offer a unique robotic fighting experience to the general public. 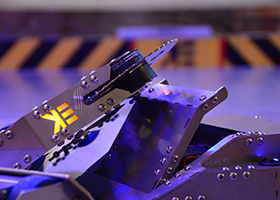 This was to allow you to take control of a fully working combat robot with real weapons in a real combat arena with special effects, just like the TV show, but on a slightly smaller but up close more personal exciting experience. 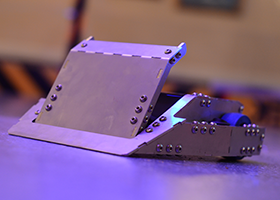 Check out our amazing battle fleet that you can get your hands on to battle against your friends and family in the high tech Kinematic Arena! 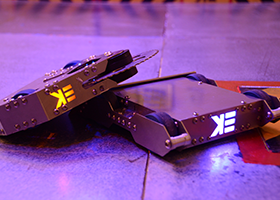 There are three types of weapons that our fleet of 5 robots use. This is either a flipper which is capable of flipping over other robots. A rammer which is twice as powerful and fast as the others to push them around and into the pit. 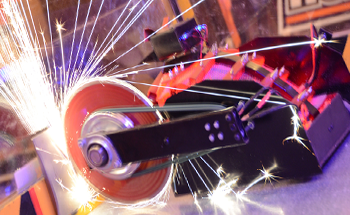 Or a nasty spinner which has a high speed cutting disc to make the sparks fly! 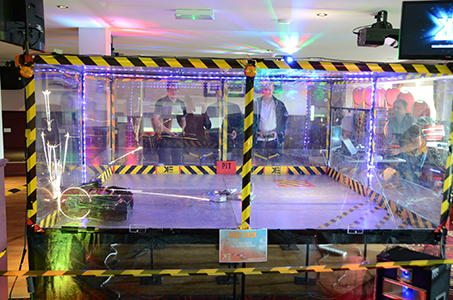 We have toured around the UK visiting many hungry horse pubs, where 1000's of kids and adults (kids at heart) have taken the controls of the robots with much enjoyment and carnage! Check out our Services page and book the battle fleet to attend your event/venue/birthday etc. 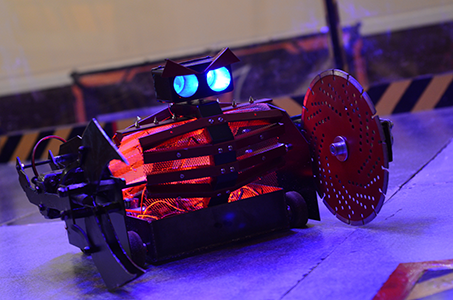 To keep the battle fleet in check, we have a nasty evil house robot called 'KRANK'. With five times more weight, power and speed behind him, he's not the robot to mess with. Krank will either be a nasty robot and try and cut you up and pit you, or wil help you off the wall if you get stuck and continue to battle against your friends and family. Loaded with a huge crushing claw which can grab and lift a beetle weight up into the air and dump them in the dreaded pit. If he doesn’t want to get rid of you right away, he will use his 12inch diamond tipped 5000rpm cutting disc to slice and dice. Let the sparks fly! 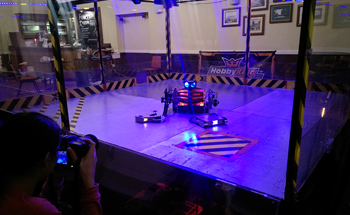 Of course - where there are combat robots, there needs to be a state of the art safe battle arena. 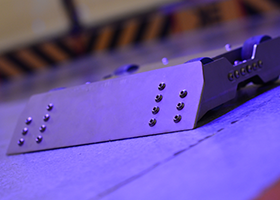 Kinematic Events have a travelling co mbat arena for the beetle weight robots to take part in full on combat battles, which allows all types of weapons, including the nasty spinners. With a thick 4mm steel floor and side walls, and 12mm thick bullet proof polycarbonate screens we can watch the sparks fly. The arena has a pit and a flip out zone, with more to come. Check out The Iron Games page to see when our arena and battle fleet are next touring around the UKs Greene King Hungry Horse Pubs! Want to hire the arena/battle fleet for a corporate event/birthday party etc, drop us an email from our contact page and we'll sure to make it a memorable experience.